These are economical PVC binders designed to accommodate presentation packs ensuring they maintain their original pristine condition. The binders can be used in conjunction with plastic sleeves (available from the Bureau) to house first day covers. A block is a group of postage stamps still attached to each other. A commemorative stamp is a postage stamp issued to honour or commemorate a place, event or person linked to Gibraltar or of general international interest. 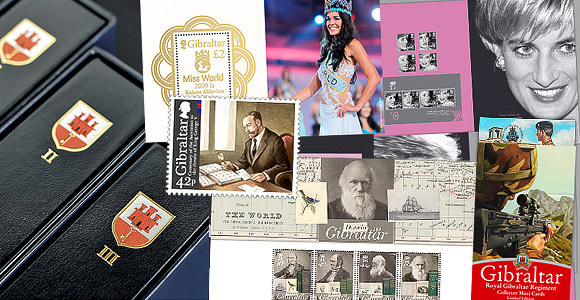 The Gibraltar Philatelic Bureau maintains a conservative number of eight issues per year with a maximum face value for mint sets of £32.00 annually. A 'definitive' postage stamp is a regular issue stamp that is part of an issue or series of stamps, normally used for a period of around five years, consisting of a range of values sufficient to cover postal rates to every corner of the globe. A first day cover is an envelope where postage stamps (either sets or a miniature sheet) have been cancelled on their first day of issue. The Bureau provides a specially designed official First Day Cover for most issues. If customers would like their own stamps affixed to their own covers this can be arranged. Gibraltar sells albums from different philatelic manufacturers such as SAFE, DAVO or Marini. These companies are the world's leading manufacturer of collecting systems so what better for storing and preserving your collection! The attractive and high quality Gibraltar Album is specially designed for our customers. Annual supplements, matching slipcases and empty albums are also available. Gutter pairs are a set of two stamps connected by a central label with or without printing on the label. The central label that separates panes of stamps is not itself valid for postage, but labels with "traffic lights" and other markings are often highly sought by collectors. Gutter pairs or gutter blocks must contain complete stamps on both sides of the gutter, with or without perforations. A common method of printing stamps and cachets in which the design is transferred from a smooth plate by selective inks which wet only the design portion of the printing plate. A miniature sheet contains an individual stamp as an addition to a set or the actual stamps from a set. In both cases the sheet will feature a unique design and is an integral part of a stamp issue and as thus they are very popular. All issues are made available in a presentation pack, which is a specially designed flap pack that holds a mount for the stamps or miniature sheet presented inside a plastic sleeve. They provide information on the subject of the issue as well as technical details. Any mark cancelling the stamp and recording an item's passage through the mail system. Commemorative stamp postmarks are individually designed and include the date of the first day of issue. Stamps sharing common design elements, often issued at one time and usually collected as a group. As the name implies, this is a pre-gummed stamp which requires no moisture for affixing to an envelope, etc. It’s like a sticker. Se-tenant stamps are attached stamps that are different from one another in any way, such as design, colour or denomination (face value). "Se-tenant" translates from French as meaning "holding together." Specially designed sheets containing one particular stamp design from an issue presented in a block (repeat stamps). 'To Pay' labels are used by the Gibraltar Post Office to collect the fee due on an unpaid postal packet. These are only issued once every eight to ten years but the last set proved to be highly popular with collectors.. This is a specially designed, full colour, high quality laminated pack containing the complete collection of the year's commemorative stamps. They come in plastic sleeves for protection and are published annually to coincide with the last stamp issued of that same year. Year packs offer information on each issue in five different languages (English, French, German, Spanish and Italian). The Year Pack is sold at face value! Should you require further information call us on +350 75662 or email us. We are happy to receive enquiries and to be of help to all our site visitors and clients.